Stir in enough flour to make a firm dough (about 1/2-3/4 cup). Remove to a floured surface and knead 100 turns until the dough is smooth and elastic. Cover and let dough rest 10 minutes. Cut the dough into 16 pieces. Shape into balls & place on baking sheet. Cover with a dish towel and let rise in a warm place 30 minutes to an hour, until doubled in size. While rising, preheat oven to 375° F.
Bake 10- 12 minutes until golden brown. Note: For soft whole wheat rolls simply replace half the flour with whole wheat flour. 58 Comments on "Easy Dinner Rolls"
These are amazing, I just cut to 8 pieces to use for sandwiches or hamburgers! Can this recipe be increased to serve 50 or more, I make the hot rolls for our church funeral dinners and would like to try this recipe for it? Ok, so I’m using Jenny’s trick of warming the egg to room temperature in a cup of water and things are going along just fine. Form the rolls, let them rise, bake, and out of the oven. When I’m putting the rolls out for lunch, what do I spy? The egg, of course, still warming in the cup of water! The rolls were still delicious and the dog’s dejected because he didn’t get one. An added delightful discovery: If you divide the dough into eight pieces instead of 16 and pat them down just a bit, these make fantastic hamburger buns. My go to recipe when I want delicious, fast, rolls. This was a great recipe, a definite keeper. I don’t have a stand mixer and they came out just fine. Are these similar to Parker House Rolls? I love your recipes and would love on for Parker House Rolls. Your videos are sooo easy to understand! I have made the braided cinammon raisin roll twice and thet were delicious. Not playing as much golf at 76 as I used to so cooking seems to be in order. the Meatloaf was better than my old recipe so I’m stuck with that one. The Apple Pie was wonderful but my top crust was a little brittle, any idea why. I going to try the braided cinnamon bread, looks loverly. You may have used too much flour with the pie crust. Next time, be sure to aerate the flour before measuring. How would you re-heat them if I baked them the night before TG dinner. I have so much to cook the morning of TG. the Turkey the Dressing and the pies. Or could I keep the dough in the fridge over night if I could arrange some time to bake them right before we serve. I would keep the dough in the fridge overnight, I don’t C where it would hurt. But, B4 I served I would bring them out a while, then to the oven. Jenny, I have just recently found out about your cooking expertise and read the “About” section on your site. You are an amazing lady! THANK YOU for all you have done to help so many people. You are such a generous soul! I’m proud to know you are Canadian. My grandkids visited Springbank Park a couple of months ago and they LOVED it! You are absolutely correct about the yeast packages in Ontario, I came across this as well, now I try to use one package of yeast for two of Jenny’s recipes: one quarter teaspoon for the no knead bread and the rest for recipes that require two teaspoons of yeast. 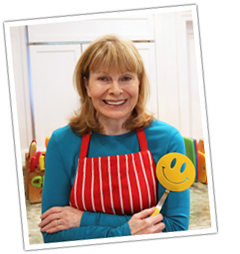 Like yourself, I love Jenny’s website and her simple and fun recipes! I live in Ontario too. I’ve made several of Jenny’s breads and have always used the entire 8gr package. Everything has always turned out very well….and delicious. Is it possible to over knead dough and, can I use my food processor with the kneading tool to get the dough going before turning it out onto my flexible pad to prep for the rise?? I made this tolls a few time and it is actually super delicious. However, the dough is very sticky thats why i knead them 50x by hand, like jenny recommend. You won’t get the same consistency by using a dough hook, if you insist, you may end up adding more flour and it wont be as moist and fluffy anymore. Sorry if I bypass jenny for answering this question. No, are you kidding? Thank you for bypassing. I appreciate the answer. I don’t count calories so I’m sorry I don’t know. CAn I use this recipe for hamburger or hot dog buns? Looking for a good recipe for buns and have not been able to find one. Or do you have one ? I messed up on the part number 6. Will it turn out ok? If I don’t have a mixer to beat on high can I still make them without using a mixer? Yes, you can make these by hand but you will have to knead for a longer time, until the dough is smooth and elastic. Have you or will try to recreate some of these/your recipes with coconut and almond flours instead of the traditional flours? Please and thank you. If so, please share the recipes😊 Thanks again! Hi jenny I make these dinner roll was very good.I love to watch you baking thanks for all recipies. Will you please do a video of this recipe? Please please please.. i love watching you baking. Can you make a whole wheat version of this recipe? I love white bread but I like to bake wholemeal bread too as it is much healthier! Love all your bread recipes by the way. They are really great! Somehow, whole wheat breads always turn out better than whole wheat rolls. You can try a 50/50 mix of white and wheat flours but I don’t think you’d be happy with 100% whole wheat. Gracias por esta maravillosa receta…!! Es la primera receta de pan que me queda magnica desde la primera vez…. Usted explica tan bien, que es muy facil seguir sus recetas…Gracias. Can I use active dry yeast instead and if so would directions for this recipe change in any way? Thanks! The only thing that would change with active dry yeast is the temperature of the milk, which should be 110 to 120 degrees. Hi Jenny! I found your site a few months ago while looking for a pierogi recipe and I’ve been trying so many of your recipes since then!! So far our favorites are the whole wheat bread and pierogi!! I remember you from when you had your show!!! Anyway, would these dinner rolls work as soft sandwich rolls if I cut them into 8 instead of 16 or do you think they would be too big? Thanks!!! Keep those recipes coming! I’m not sure but it seems like it would work. Do u have a method for cutting the dough so they are shaped like hot dog buns. I made hamburger buns &I they are terrific. But could use some help in shaping & cutting into hot dog buns. I freeze them also &I they stay very fresh &I as god as day I baked them. “freeze them”? Affer baking or freeze the dough? How do you bring them back to fresh taste? I freeze them after baking. It’s always best to thaw them overnight in the refrigerator. The next day you can serve them at room temperature or warm them up on a baking sheet in the oven at 300 degrees for about 10 minutes. Thanks for a great recipe, really tasty! Made 8 dinner rolls and 4 hamberger buns for dinner. Do u have a receipe for hamburger &a hot dog buns? If not I would really like for u to come up one made with whole wheat bread flour. I do not have a recipe for these buns. 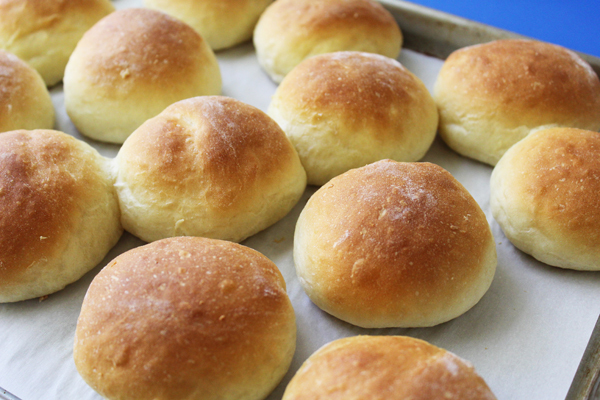 Would this receipe for dinner rolls be used to make hamburger &a hot dog buns ? I made this today, and I think it’s quite easy to make (I just started to bake 3 weeks ago ;p). I am so happy that I could find another great yet simple recipe. Thanks! I’ll try this then! If I am mixing by hand, how long should I kneed everything? Probably 150 to 200 turns or until it feels smooth and elastic. I’m from panama…love all your recipies Jenny jhones…specially cinnabons rolls i baked them and were an event in my family ….they loved your recipe….